This tool is a collaboration with Overwolf and the community around Reshade. 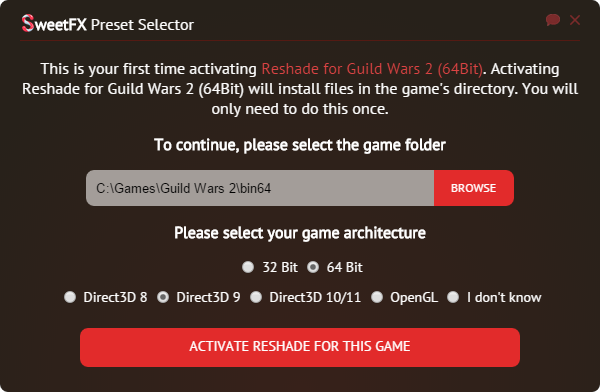 It allows easy installation and preset selection for the Reshade framework. The selector works for pretty much any game out there, so go ham with it! Setting up Reshade manually can be complicated. The SweetFX Preset Selector automatically detects your game, its installation path and the renderer that is used. This means in almost all cases you just have to click on "Activate" and you're good to go. Also, if you decide you don't want to use Reshade anymore, there's no more guessing which files belong to Reshade and which ones belong to the game: Just start the app without any game running and it will give you an option to easily remove the installation again. To make things even easier, the tool gives instant access to the sfx.thelazy.net database. 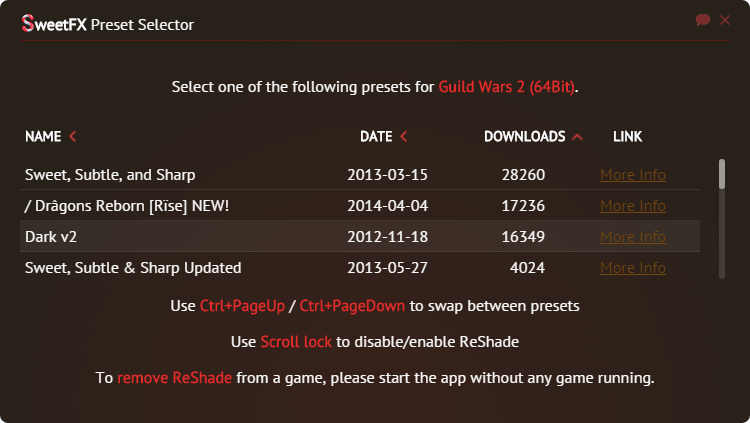 You can change your preset and finding your favorite one with just a few clicks. The SweetFX Preset Selector is completely free and available on Overwolf's app store.